I have received the sad news of the falling asleep in the Lord of His handmaid, Mother Christina Baz, Abbess of the Patriarchal Convent of our Lady of Saidnaya in Syria. 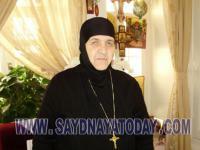 Not only was Mother Christina related to me (her mother and my grandfather were siblings), she was known to several people in our Archdiocese, to priests and bishops, to His Eminence Metropolitan Philip, and to all who visited Saidnaya Monastery in the past. She reposed on All Saints Sunday, most fitting for a nun who lived the monastic life all her life, especially when we heard the Gospel on Sunday, the Lord Jesus saying: "And every one who has left houses or brothers or sisters or father or mother or wife or children or lands, for my name’s sake, will receive a hundred-fold, and inherit eternal life" (Matthew 19:29). Among the Clergy Brotherhood in our Archdiocese, I am her only living relative. And may God have mercy on us, Amen.